Dreams – Some People Would Die For Theirs. Is Yours Worth Living For? Posted on January 20, 2015	by Denise Banks-Grasedyck, Coach. Consultant. Speaker. The bigger, the bolder our dreams are, the more daunting they can seem to us. The more we value something, the greater is the fear of taking the wrong action, so we take no action at all. But a dream kept in a locked closet, or sealed away inside us, is nothing more than future regret in its seedling stage. But if there are dreams worth dying for, shouldn’t your dream be worth living for? No emotion, just a strong, determined look and eyes that flickered with a flame from somewhere deep inside; you know, that place where true conviction, passion and our biggest dreams reside. To say the least, I was impressed, moved and fascinated. A quick shudder went up my spine causing me to tremor. The seventeen-year-old caught my involuntary spasm, stopped speaking, shifted upward and smiled almost apologetically. This week many people and communities around the world are honoring Dr. Martin Luther King Jr. and his legacy of peaceful change and his dream of a world in which fear, hate and discrimination are completely displaced and replaced, by love, peace and justice. Dr. King had a dream that he was willing to be beaten, jailed and ultimately, to die for. I posted this last year on the birthday anniversary of the honorable Dr. King. In our current so trying times around the world, I think it bears repeating. I am reminded that in previous years MLK celebrations have also taken place here in Berlin, Germany, where I live. Last year I was thrilled and honored to be invited to participate in one of those events, where I had the opportunity facilitate discussions on the causes and responses to racism and discrimination with a group of 15 to 19 year olds from different regions of the country. One of the students I had the privilege to work with was the seventeen-year-old young German, Daniel1, who lives in one of the regions known for its right-wing affinity and who had been the target of multiple violent beatings. He had been attacked repeatedly simply because of his conviction to the dream that he shares with Dr. Martin Luther King. Daniel is committed to creating a world of peace, freedom and justice for all people regardless of race, religion or sexual orientation, and he refuses to let anyone or anything get in his way. He is utterly committed to his dream, his big goal based on his core values and Daniel’s words, his actions; everything about him is aligned to making it happen. This kid is on fire! When we begin to look at how their goals and actions support and align with the dream, the fire dims to glowing embers, doused by fear. The bigger, the bolder our dreams are, the more daunting they can seem to us. The more we value something, the greater is the fear of taking the wrong action, so we take no action at all. But a dream kept in a locked closet, or sealed away inside us, is nothing more than future regret in its seedling stage. Do you have a dream worth living for? Now is the time to stop hiding behind “too much to do”, “too much stress” and “not enough…” Get clear on what your dream is. Create “goals with meaning”, that is goals that are rooted in your core values and reflect your dream. Align your goals and your actions to that dream that means so much to you, so you can make it happen. If you believe something is worth dying for, it deserves your best effort at living for! Are you ready to achieve your goals and start living a dream with living for? Whether you need clarity on your goals and alignment with your core values or you want the courage, confidence and a plan to make them happen, I am here to help. Send me an e-mail at info[at]banks-grasedyck.com or give me a call, +49 (0)176 556 19 112! 1 The name has been changed to Daniel for privacy protection. 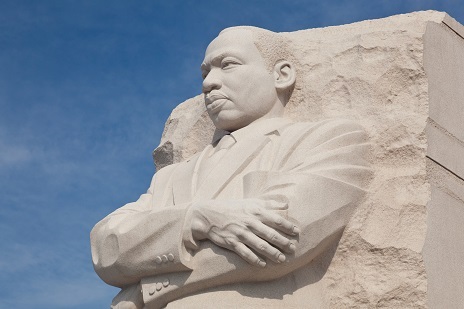 This entry was posted in Insights and tagged Dr. Martin Luther King, follow your dreams, goal setting, MLK, motivation. Bookmark the permalink.